Yesterday I wrote about Vipe, the powerful video marketing service that my friend Adam Peterson founded. In addition to being a knowledge expert on web-based video, there is another area where my friend Adam sets himself apart — he is a master facilitator of introductions. Adam recently introduced me to his friend Rajesh Setty, who is an entrepreneur, author, and speaker. About a week ago, I sat down with Rajesh for a cup of coffee. I really enjoyed my conversation with Rajesh. In a little less than an hour, he provided me with some insights and a renewed sense of energy for a few of my own projects. I appreciate Rajesh’s wisdom and Adam’s thoughtfulness to introduce me to him. Rajesh radiates a powerful positive energy. He is very accomplished and has a lot to offer. 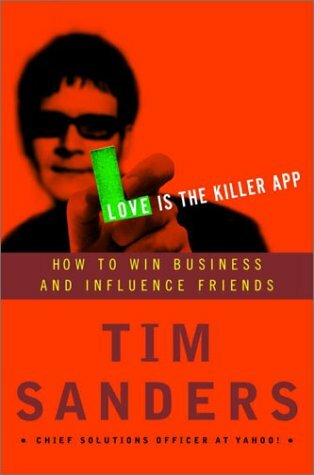 In our conversation, Rajesh and I spoke of some of his other projects and our conversation turned to a book written by Tim Sanders called Love Is the Killer App: How to Win Business and Influence Friends . I had read this book back in 2005 and loved it. After speaking with Rajesh my excitement about the book was rekindled and I went home and began reading it again. If you are in the business world and have not read Tim Sanders book, I suggest that you do. Tim will teach you how to elevate your life by sharing your knowledge, network and compassion. When you do this you become what Tim calls a lovecat. Prior to my meeting with Rajesh, I have to admit that I had fallen off of my reading habit. In essence, I had become stagnant. I am thankful to Rajesh for inspiring me to get back in the groove and to reread Love Is The Killer App. This is exactly the book that I needed to start with since Tim emphasizes the important of knowledge – you can’t give what you don’t posses. Thanks to Rajesh, and Tim’s book, I am excited to be back on the greatest learning curve of my life. What are some of the great books that you have read? and Who are some of the people that you find energizing to spend time with? This entry was posted in Books, People Worth Knowing and tagged Adam Peterson, business, entrepreneur, Rajesh Setty, THINKBook. Bookmark the permalink. I think Love is a Killer App is one of the best books I’ve ever read and I recommend to people to read the chapter on how to read a book, if nothing else. Most of the books I’ve read since are marked up as the author suggests. Thanks for reading my post and leaving a comment. You make an excellent point. Tim Sanders provides some great tips on how to read a book and process the information so that you can make it your own. Thanks for sharing this recommendation for other readers. What other books have you enjoyed reading? Cool post, it’s always interesting to hear about entrepreneurial ventures. It’s definitely energizing to spend time with people that are optimistic, glass half full. Thanks for reading my post and leaving some feedback. Are there any books/blogs/websites that you would recommend to help others get charged up and get their creative juices flowing? Much like you I love learning about entrepreneurial ventures. Just last night I had dinner with a friend and he shared a very interesting project that he will be launching near the end of this month. I expect I will write a future post about it as it continues to develop. Thinkbook is a workbook neatly captured in a notebook – but in a digital world everything is synched in an application on the cell phone. It is a great idea by an entreprenuer when most leather bound books would lie around the house gathering dust. This prompts the people to actually write …? May be . At least I liked it when I found this book at my Boss’s desk. Besides that, the price point is a bit on the higher sidefor the many empty pages ( not to forget that it is a workbook ) . However it would make great gifts for a young workforce – 3 -4 years out of college – mid twenties . Hello! Thank you for your comments. You are quite right about how easy it is to access digital notebooks from our cellphones these days. I myself am a big user of the iPhone notepad as well as the Evernote app that allows me to sync my notes across multiple devices. However, I do enjoy having my THINKBook when I attend a seminar or conference since I still enjoy the process of taking handwritten notes while someone is speaking. You are quite right. The THINKBook would make an excellent for a recent college graduate, but I think it would also benefit anyone who wants to capture their ideas on paper.